Tony Hart is one of the NAPPI training team, a British Institute of Learning Disabilities (BILD) accredited trainer and an 'Expert by Experience'. In 2013 Tony was acknowledged by BILD as being "the first service user to present at panel." Whilst enjoying being the first, Tony doesn't want to be the only one. Tony realised that to be taken seriously as a trainer he needed more credibility. With this in mind he recently completed the BTEC Level 3 Award in Understanding and Using Inclusive Teaching and Learning Approaches. Supported by his tutor and training partner, Tony has developed his BILD presentation into an interactive teaching session. Using the dynamic graphic of the NAPPI PBS model, Tony explains how the use of Positive Behaviour Support has enabled him to cope during times of stress. He explains to his participants that it is the little things that they can do everyday, that can dramatically improve the quality of life of the people they support. "This session has helped me recognise that even the smallest contributions to somebody's Green Scale can have a big effect to their quality of life"
"Very interesting to hear new and well informed point of view, I will now adjust how I plan activities with the people I support"
"Tony highlighted how simple and effective the NAPPI PBS Model can be, and has been throughout his journey in care"
"I am really looking forward to sharing Tony's message with my staff and service users. Tony proved that this works, Thank you!" The BILD Code of Practice (2014) states that "Training organisations should consider how they can develop and or/deliver in partnership with individuals who have a lived experience of services". 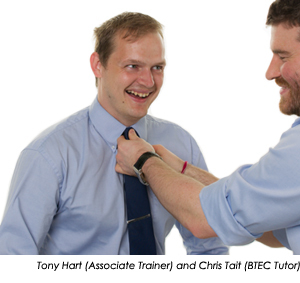 Tony and Chris are available to support other organisations to develop training partnerships.